Breast cancer is one of the leading causes of death among women, but it can also affect men. Approximately one out of every nine women will develop breast cancer in their lifetime. Mammography is X-ray imaging of the breast to detect breast cancer. In many cases, mammography can detect tumors while they are still small and most easily treated. Mammography is an important diagnostic tool. Studies show that women who are treated early for breast cancer have a five-year survival rate of 82 percent. Women whose cancers are not detected and treated early have a five-year survival rate of just 60 percent. When X-ray technology was first developed in the late nineteenth century, doctors began applying it to different medical problems. German surgeon Albert Salomon was the first researcher to use X-ray technology to detect breast cancer. Salomon used X-ray photography on breast tissue that had already been removed in order to see the differences between healthy and diseased tissue. When reviewing the resulting X-ray pictures, Salomon discovered that there were a number of different types of breast cancer. He published his findings in 1913, but never used the technique in his own practice. 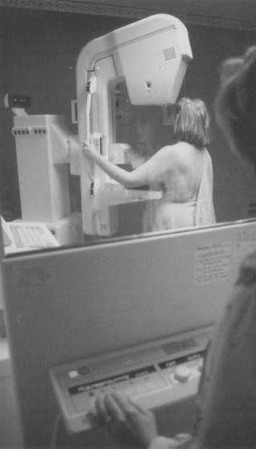 A woman undergoes mammography screening. For women under forty, the procedure is recommended only for those at risk of developing the disease because ofa family history of breast cancer or other high-risk factors. In the 1920s other researchers provided more detailed guidance on detecting cancerous tumors with X-rays. A German researcher named W. Vogel fully described how X-rays could detect differences in breast tissue. In fact, Vogel's guidelines are still used by doctors today. Stafford L. Warren, an American physician practicing in the 1930s, was the first doctor to use mammography to diagnose breast cancer prior to surgery. In the mid 1950s, thanks to the Jacob Gershon-Cohen's use of mammography to screen healthy women for breast cancer, mammography became more popular among doctors. By the 1960s mammography was a widely used diagnostic tool. Some critics claimed that the X-ray procedure exposed women to dangerous levels of radiation, but much of this criticism stopped with the development of more sensitive film that significantly reduced the amount of radiation used in the procedure. The National Cancer Institute conducted a four-year study (1973-1977) of some 270,000 women throughout the United States. It found that large numbers of women who had very small, benign (non-cancerous) growths had undergone breast surgery, many after mammography screening. Some researchers felt many of these surgeries were unnecessary. As a result of the study, the Institute issued guidelines regarding which groups of women would benefit from regularly scheduled mammograms. For women under forty, the procedure was recommended only for those at risk of developing the disease because of a family history of breast cancer or other high-risk factors. Seem like I remember my first mammography in the 60's was done by using balloons. Have you ever heard of such? I had a mammogram in the '60s at Lutheran General Hospital, north of Chicago, where they used balloons. I remember it very well.